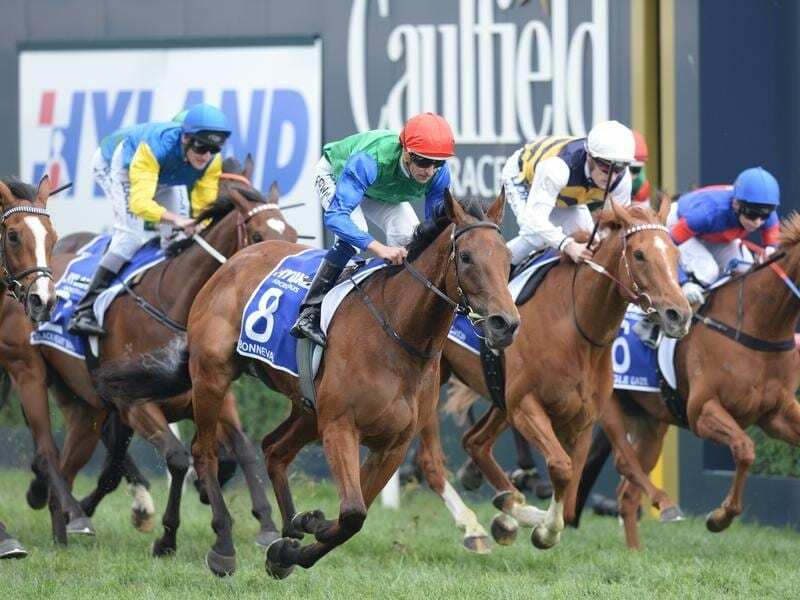 Underwood Stakes winner Bonneval (red cap) is New Zealand’s champion for a second time. Bonneval has been crowned New Zealand’s Horse of the Year for a second time. She is the fifth successive winner of the title to be trained by Murray Baker and Andrew Forsman who also won the NZ premiership. The record-breaking training partnership prepared the 2014 winner Dundeel, who was followed by Mongolian Khan (2015, 2016) and Bonneval. The winner of the Underwood Stakes in Melbourne last spring, Bonneval was the only New Zealand-trained horse to win a Group One race in Australia during 2017/18. Bonneval was also judged the best middle distance performer, Sydney Cup placegetter (Sir) Charles Road the Stayer of the Year, Kawi the sprinter-miler, Savvy Coup (3YO) and Avantage (2YO). Baker and Forsman also won the Trainer of the Year category, premier jockey Sam Collett the Jockey of the Year and Isaac Lupton was voted champion jumps jockey for a third time. Bonneval did not race in the autumn after suffering a suspensory ligament injury but trialled last week ahead of another trans-Tasman trip for the Melbourne spring carnival.